Insert shocked emoji face here. Not only is the Vatnajökull an extremely popular glacier in Iceland - and just a cool thing to do (did you get that pun). But it is also the biggest glacier in all of Europe! Yup. Definitely a bucket list item. Tours for the glacier book up fast and luckily I was able to secure a last minute spot on a tour with Glacier Adventure! After a quick inquiry on Sunday night I grabbed a spot on a tour the next day. Early Monday morning after waking up a couple of hours after the best sunrise of my life, at the Glacier Lagoon, I packed up all my stuff and headed to Hali Country Hotel reception for the tour. When I arrived at reception, I was greeted by our friendly guide for the day. Sindri, a local who grew up right around the corner from the glacier, also grew up close to the Icelandic tourism industry. Sindri's father worked for a large hotel brand and him and Sindri, spent summers traveling around Iceland fixing any problems at the hotels. The stories Sindri told us about Iceland, from years ago, were fascinating and such a joy to hear about. By noon, our whole group arrived and I was pleased to see it was quite small. 4 people total - all girls I might add - and our guide. This was already setting up to be an epic day. Being able to experience a glacier in a small setting is one of the top reasons I loved my tour with Glacier Adventure. Their small groups meant a more unique experience and a less "touristy" feel which is sometimes hard to find in South Iceland. We introduced ourselves quickly and hopped in a large jeep to start our journey to the foot of the glacier. About a 10-minute drive from the hotel was a turn off on a dirt path. Our huge wheels maneuvered the landscape easily and the 45-minute drive across the rough Icelandic landscape flew by. Sindri entertained us with stories about Iceland's history and some of the more strange and scientific natural wonders that Iceland holds. Once we got across the bumpy hills we arrived at a small lake and boarded a small zodiac boat. The boat ride was literally less than a minute but it was thrilling. I could feel adventure was close and calling my name as the wind blew through my hair. After disembarking from the boat we geared up; helmets, harnesses, crampons (ice spears that go around your shoes) and ice axes. Ready to go we started our walk, next stop: The mighty glacier. We started the climb by maneuvering through a mixture of rocks and ice. Sindri was there the whole time, guiding us, and making sure we didn't take a single step wrong. 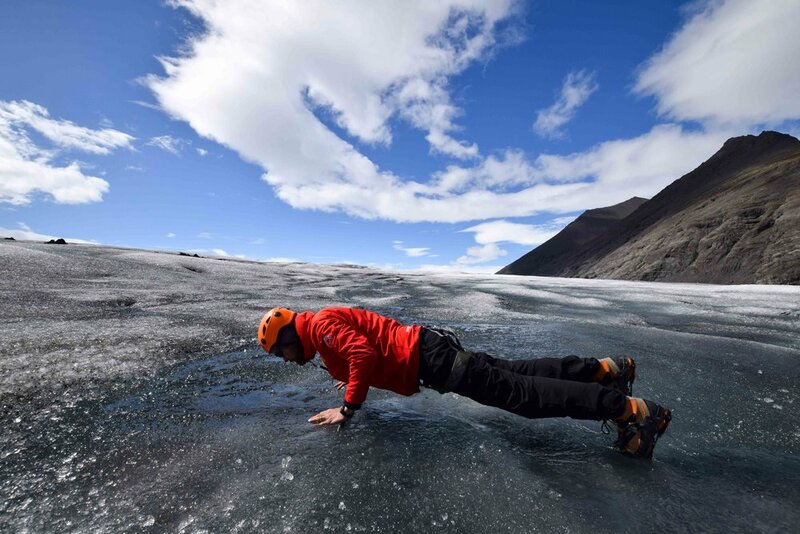 The glacier has its own climate and although the wind had been relatively calm back at the hotel it was strong on the glacier. Even Sindri was feeling a bit unsteady, we were walking on solid ice after all. He informed us that the wind may cause issues and he would be extra careful today making sure we were walking correctly and slowly. If he felt it was getting too strong or received a call on his radio from the office (who monitors the weather as we walk) we would have to immediately turn around and back. Safety first. We made an interesting stop at a view point that showed the massive Glacier Lagoon. The same one I had woken up in the morning, from the perspective of the glacier. Most tourists never get to see how immense the glacier lagoon actually is. The majority of the lagoon is hidden around a bend that is not visible from the tourist view point. We were now apart of the lucky few. 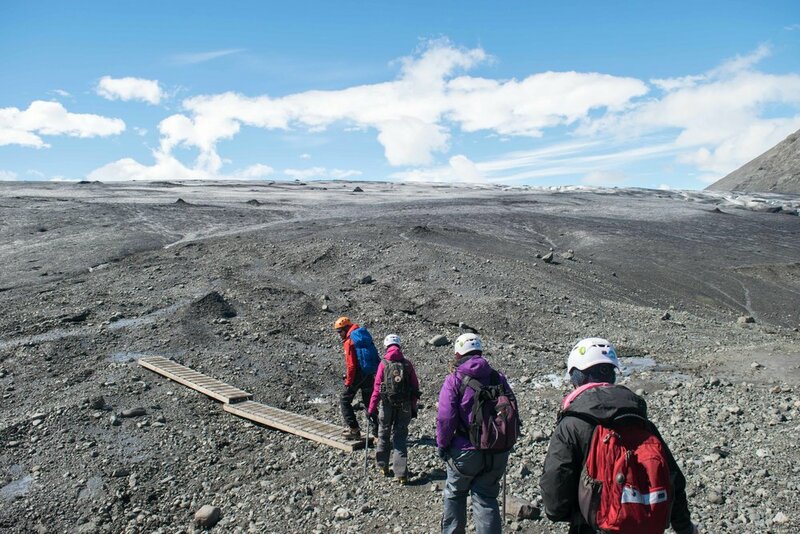 Glacier Adventure is the only company with access to this specific view point. It was mind blowing seeing the scale of mother nature. Just another reason I am so happy I went with their tour company over the rest. Our last stop at the very top was a small stream that was flowing on the surface of the glacier. Sindri swung his ax and made a bridge from one side to the other. From there he showed us how to drink straight from the stream. Effortlessly, he went into push-up position, hands on the ax, feet on either side of the stream, and then in perfect form did a slow push-up. At the bottom of the push-up, he drank from the stream effortlessly. Although Sindri was easily in better shape than any of us, it was now our turn. One by one we got into the same push-up position and drank the glacier water. The ice cold water was some of the most delicious liquid I have ever tasted. EVER. So pure and fresh. Just perfect. After we each had a turn drinking we filled up our water bottles one at a time. After our water stop we then began the trek down. What had taken us over an hour to climb took us only 10 minutes to walk down. I didn't want my time on the glacier to end and was sad when I started walking on the dirt and gravel mixture that signaled we were no longer on the massive glacier. At the bottom we took our crampons off, gave them a quick wash, and boarded the boat that took us back to our jeep. Our whole group was pretty quiet after we got off the glacier. All lost in thought at the epic adventure we had just experienced. If you are in Iceland don't miss out on walking on Vatnajökull glacier, it is definitely an experience I won't forget. There are quite a few companies who take you up there but I definitely recommend Glacier Adventure above the rest. Not only are the groups smaller with them but you also get the unique view of glacier lagoon from a top the glacier. A view no other tour group gets to see. 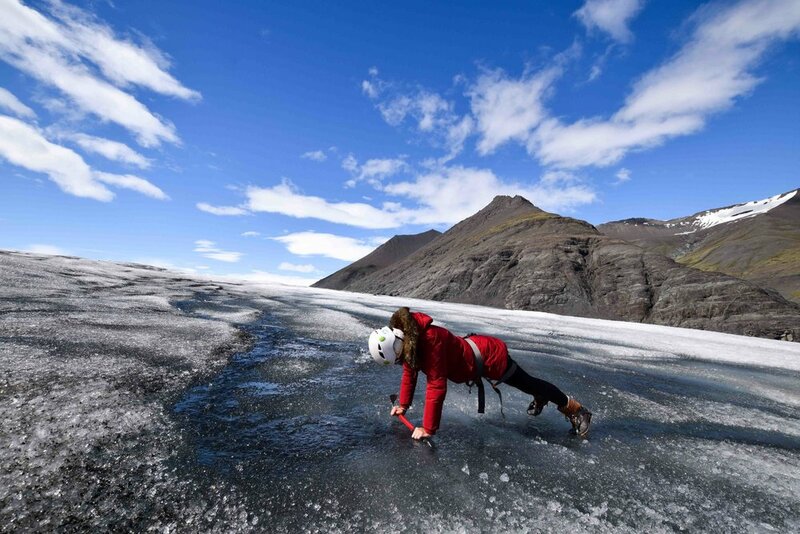 You can find more information on Glacier Adventure's tours here.